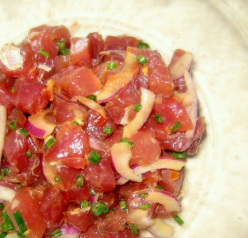 This poke is so that all Hawaii people not living in Hawaii (ex-pat Hawaii folks) can get their fix. It doesn't use the traditional limu/ogo (seaweed) or inamona (smashed kukui nuts). Inamona has traditional Hawaiian medicinal use as a laxative, so not everone tolerates it well. Moreover, if you do not live in Hawaii, these things are very hard to get. Believe me, I've tried. This recipe is mostly from my dad, but I also checked online and my trusty Sam Choy cookbook. When I was trolling the online poke recipes, substituting macadamia nuts for inamona came up a few times, but I don't recommend this. The most important thing is to get the "freshest-fresh ahi". Fresh fish, weirdly enough, will not smell 'fishy'. It's best buy a chunk rather than pre-sliced. Air degrades fish pretty quickly into a mushy mess. Cut the ahi into bite-sized chunks. Mix in sliced onions, as much as you like, but the fish should dominate. Sprinkle in green onions to your liking, but again, making sure the fish is the dominant ingredient. Add 2T of shoyu and 1T of sesame oil and toss everything together. If you need to add more sauce, add in the same 2:1 ratio. Conversely, if you are making a single-size serving, reduce the amount of shoyu/sesame oil, but keep the same proportions. Add a dash of chili oil if you have it, and then sambal oelek to your taste. Start off slowly. Let this sit for at least an hour. Roast sesame seeds sprinkle over right before serving.